Submitted by ben on Sun, 01/27/2008 - 20:25. Say what you will about federal energy policy in the U.S., you have to give credit to the Department of Energy’s Energy Information Agency (EIA). In my experience spending endless hours looking for energy consumption, production, price, fuel types, trends, outlooks, predictions (you get the idea) statistics, no other organization has been more of a one stop shop than the EIA. The next best resources are distant second and thirds (BP statistical review and the IEA). To my knowledge, no other country or organization makes access to invaluable energy statistics as easy or as readily available as the EIA. In fact, I could spend some time criticizing other governments (mostly my government) for not providing resources that even come close to the EIA’s. I once emailed Stats Canada (the keeper of Canadian stats) for a report that they published on transportation trends and they actually wanted to charge me for it! Having to pay for an IEA report is one thing, to my knowledge my taxes don’t fund their reports, but having to pay twice for a simple Stats Canada report? Anyway, I digress. The point that I want to make from the above is that I appreciate the EIA and all that they do. If you look hard enough (and I did), they can also provide a good history lesson. I scrounged up energy consumption statistics in the U.S., by fuel type, dating back to 1635 (and since 1949). To be sure, there must have been a fair bit of estimating going on, considering that the Department of Energy, as we know it today, was only created in 1977, not to mention the U.S. didn’t actually become a country until 1781. Of course, the breakdown of fuels way back then wasn’t too interesting, instead of using coal, petroleum products and nuclear energy, energy before the 19th century came mostly from burning wood. At this point I should put in a disclaimer: whale oils were used back then for lighting but the EIA doesn’t seem to include these stats. In Amory Lovins’ report (Winning the oil endgame), his research revealed that roughly 30 million gallons of whale oil was produced in 1821. This sounds a bit too high to me (on a side note, does anybody know approximately what the energy density of whale oil would be?). So, how did the settlers live 218 years ago (since the first U.S. census)? 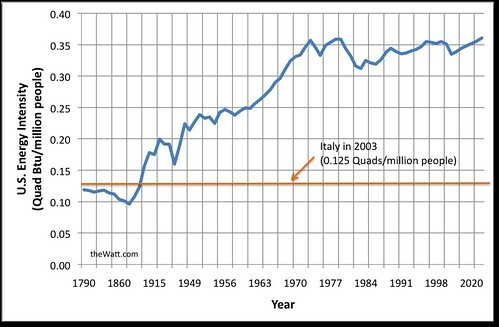 Amazingly, as Figure 1 shows, with roughly the same energy intensity (energy consumption/person) as the average Italian lives today! Again, I intend to emphasize energy intensity in upcoming columns, but needless to say, this finding surprised me. There is still some ambiguity here since I’m not sure exactly how this energy was used back then, a good guess is that it’s mostly for heat. Also, it’s a good bet that the efficiency of your typical energy conversion device in the 17-1800’s has improved somewhat today. But the fact that Italie's human development index is 0.941, compared to U.S.'s HDI of 0.951, yet Italians manage to consume roughly the same amount of energy per person as an American did 218 years ago is quite impressive. In 1790, the first US census revealed 3.9 million people living in the United States of America, and the EIA estimates that they consumed 0.47 Quadrillion Btu’s, entirely from wood biomass. 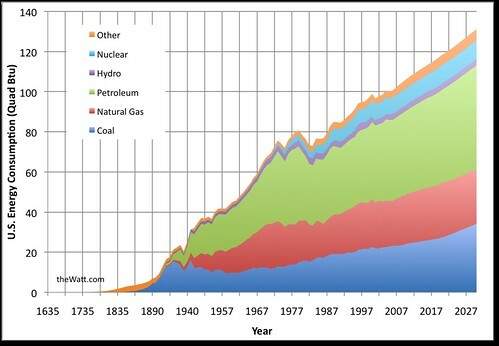 As Figure 2 shows, coal didn’t register until 1850, petroleum until 1860, natural gas until 1885, hydro in 1890 and the first electron consumed at the hands of Americans from nuclear power came in 1958. 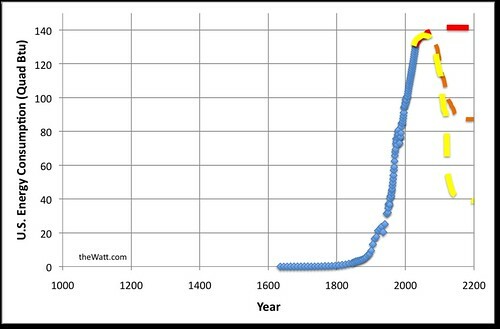 Clearly energy consumption increased quickly since the 1900’s and there was no looking back once oil was discovered. How else was the Ford Model T supposed to run in 1907? Oh yeah - they did have battery electric vehicles back then too. Since the end of the 2nd World War and the birth of the suburbs, petroleum has dominated energy consumption and its share of primary energy has increased quickly from 2.4% in 1900 peaking at 47% in 1977 and since the 1980’s has stabilized to around 40%. The next question would be, how long can it continue? You’ll notice that my chart goes up to 2027, those are the Department of Energy predictions. The fact that they see oil maintaining exactly a 39% share between now and 2027 tells me that they may have taken a simplistic approach to their predictions. So, what does the future hold? As I think Figure 3 shows for certain, year on year growth in energy consumption cannot continue indefinitely. 1000 years from now, will people look at this graph and see a blip that was fossil fuel consumption around the year 2000? The chart below shows the only 3 possibilities: 1) a plateau of energy consumption 2) a crash and plateau and 3) a bad crash and a plateau. The good news though is that even if energy consumption levels in the U.S. fall from where they are now, to where they were 218 years ago in the U.S., it'll still be possible to maintain a standard of living as relaxed as your average Italian.